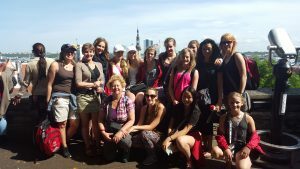 Elena's Rhythmic Gymnastics Club was a part of Team Canada for the 2011 World Gymnaestrada in Lausanne, Switzerland and for the 2015 World Gymnaestrada in Helsinki, Finland. We also preformed with outstanding success at the 2010 and 2014 National Gymnaestrada. Our teams are composed of our competitive team, retired gymnasts, coaches and even parents! Our next elite performing team will be for the 2019 World Gymnaestrada in Dornbirn, Austria. The National and World Gymnaestradas take place every 4 years - like the Olympics! There is a lot of preparation, team building and training that happens to make each event a success. Sep 2015-June 2017 are our preparatory years. A lot is learned from each event, and coming home from Finland in July 2015 has given us lots of inspiration yet again! During these two years, we focus on building the caliber and strength of our athletes. This way, when it is time to come together for the gymnaestradas, we are in top condition! Sep 2017-July 2018 we prepare for the National Gymnaestrada! This is such a fun and prestigious event, with all of Canada coming together in the summer to show off their hard work and their amazing performances at one big festival. Also, the most outstanding groups are selected for coveted spots at the upcoming World Gymnaestrada. We bring our very best to this event and it is such a great opportunity for our girls to perform, in their own country! Sep 2018-June 2019 is the biggest and final year of the cycle! We gear up for the largest athletic event in the world. Excitement is high as we train to be our best on the world stage and make Canada proud! July 2019 - We are in Austria! The team will have the time of their lives performing, watching spectacular athletes from all over the world, attending world-class galas, exploring Austria and neighboring countries. The eye-opening amazement is non-stop and truly an unforgettable experience. For current team schedule and fees, please check the table on the Competitive Program page. 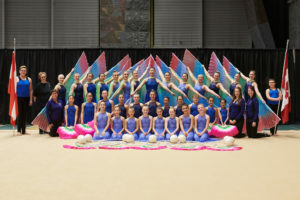 For more information about the 2019 World Gymnaestrada - visit their official website!